Wall mounted Digital signage for offices which can be placed behind the office reception and entrance to get the visitors attention and give more details about your company. 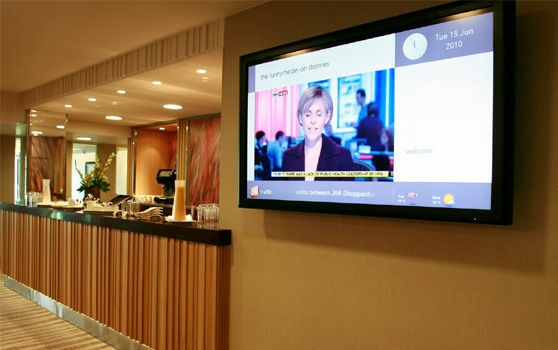 Wall/Ceiling mounted digital signage solutions include from single screen to multiple screens such as video wall and large formate displays inlcude LED Billboard for offices, hotels, hospitals, governments, Ad Agencies etc to feed live information and advertisements. No more hassle to find your favorite shop in the shopping mall or visiting patients and doctiors at hospital. With our system we give you the freedom to get lost in the crowd and to the find your wayback in. OxyDigital interactive wayfinding helps the passengers at the large airports to reach thier boarding gate on time. Our solution can also be implimented in campus premises. OxyDigital award-winning digital signage content design specialists can bring their experience in design and usability techniques for your project. We can provide anything to match your organisation themes and to create custom interactive videos for your Digital Signage. Never worry about printing mistakes with traditional boring menu cards or updating the price on regular basis. OxyDigital's Digital Menu Boards takes care of your unnecessary spending, reduce the cost and enhance the look of the restaurant. It helps to drive your revneue up as well as entertain the customer while in que.